I got to Port Angeles (right near one of the park entrances) late Friday afternoon. I drove around a bit exploring and by the time I got to an entrance place the ranger stations were closed. 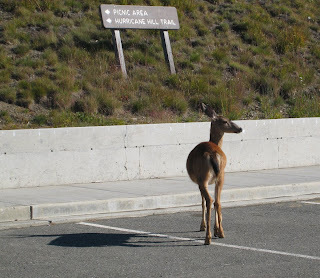 I didn't have the right cash on me to buy the requisite passes without somebody giving me change, so I went back into town and had dinner, eventually deciding to sleep in the back of my truck on a turnout on the road up to Hurricane Ridge. In the morning I finished the drive up to the ridge. 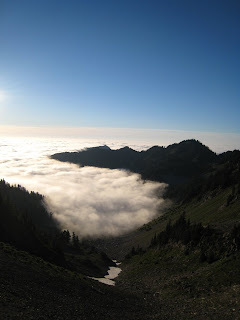 The ridge was above the clouds, it was beautiful and sunny and I wandered around some of the trails and the visitor center before heading back down to the main visitor center at the park entrance where I could get a back country pass. 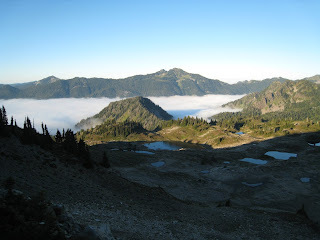 I had been thinking about going to the Olympic hotsprings and hiking the ridge near there, but the ranger I talked to said that those hot springs were pretty sketchy and recommended I camp along the Seven Lakes Basin. I took his advice and off I went. I didn't actually make it to the trail head until about 2 in the afternoon and the hike would be longer (and with a heavier pack) than what I am used to. Each day of my trip was about 9 miles and the elevation gain was around 3000 feet (I think the ridge I would be camping on was at around 5000 feet). So I was a little concerned about getting to my campsite before it got dark. The first few miles were rough. They accounted for much of the elevation change and were under pretty but enclosing woods. Those miles were also under the overcast sky, though that was actually fairly welcome as I was working up a fair bit of heat climbing the hill. There were several unnamed camping spots along the trail that tempted me pretty heavily, as I passed the cloud layer around the 3000 foot level they were even more tempting, but I decided I would be more satisfied if I just pushed on. Finally I made it up to deer lake where the steepness slacked off a bit and the vegetation began to open up. There were a lot of blueberry bushes along the trail to replace the trees which were fading back. The ripe blueberries were particularly delicious in the exertion of the day. With all the berries, I kept expecting to see some sort of bear sign but it was conspicuously absent where I was walking. It was wonderful walking above the tree line, out in the sun. Gorgeous mountains and clouds everywhere I looked. Around 5:30 I got to the spur trail down to Lunch Lake where I could have camped. In that area of the park you have to reserve your camping spots and I was fortunate that there were a couple that had become available due to last minute cancellations. 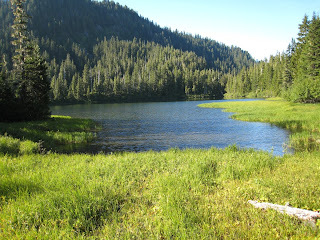 Lunch Lake is in the Seven Lakes Basin. It looked like a nice area to camp, but I chose instead to camp at a spot along the ridge a mile or so onward (according to the ranger - I suspect it may have been closer to two miles). By that time my knee had begun bothering me pretty badly, it seems as though going up hill exacerbated it, but going downhill was even more painful. From Lunch Lake I took my time, nursing my knee, enjoying the views, and the cool plants along that section of the trail (I will probably do a separate entry about the living things I saw on the trip). I had a particularly beautiful view as I came toward the intersection with the trail from the Hoh Valley and the High Divide trail (where I would be camped along). As I got towards the intersection I saw a man standing on the trail leaning on his hiking pole and looking through his binoculars. When I got closer he told me there was a bear around the corner. I walked over to him and saw a bear eating blueberries probably 100 feet above the trail I would be walking on. He said he had been standing there for an hour trying to decide what to do because he had wanted to camp up not far from where the bear was. We talked for a bit and I left him to his decision making, happy to get the chance to see the bear which looked at me briefly as I walked by, but otherwise ignored me. Not far from there, as I rounded the slopes near Bogachiel Peak and could again see into the basin, I saw another bear walking along down there. Another man came walking along the trail and we talked for awhile. He was camping at Lunch Lake and had taken a "short cut" up to the high divide trail to look around, but upon turning back saw the bear walking in towards where he would have to walk on his short cut back so he decided it would be better to hike the longer way back. He assured me that my campsite was not far down the trail and was glad to hear I was at it, since he had walked by and saw nobody was there and it was such a beautiful spot. When I got there, I had to agree, it is quite beautiful. The view of Mt. 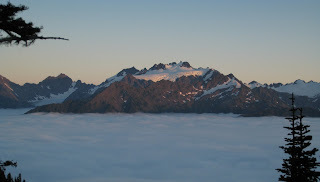 Olympus over the cloud covered Hoh Valley was amazing. On getting to my campsite, I set out my sleeping stuff and got down to the business of eating some food and enjoying the views. I had probably an hour before it started getting really dark which I was looking forward to as I don't often get to see the stars away from the lights of civilization. While I was laying in my sleeping bag waiting for it to get really dark I saw a small bat flying around in the opening along the campsite. I also thought I heard some foot steps in the vegetation a little ways away, but made a lot of noise moving around in my sleeping bag trying to look in that direction and by the time I quieted down I no longer heard it. Even more thrilling was the elk I heard bugling down towards the Hoh. I don't think I've ever heard them bugle before. Finally it got dark enough for the stars to really pop. It was incredible. It's kind of funny how the constellations are a bit harder to pick out when the stars are more visible - there are just so many stars to pick them out from. I laid out under the stars for a half hour or so until the cloud level began to rise and haze up the view. Laying under the stars reminded me of some trips when I was a kid and my best friend and I went camping in the boat with our dads who would sing to us as we laid back looking up at the night sky. The morning was a little bit of a rude surprise. I had been hoping that the cloud level would be back down in the morning, but it stayed firmly above me the whole day. And to top it off, while I lay in my sleeping bag hoping that the clouds would burn away it began raining. Seeing that it was unlikely that the weather would improve anytime soon, I got up around 8 and headed on my way. Going downhill was quite painful to my knee and since it was just the beginning of a long day of going downhill I was a little concerned. I kept my eye out and found an acceptable stick I could use for hiking which was quite helpful in mitigating the pain. I also bummed some ibuprofen off a nice lady who was looking at plants and birds while waiting for her partner to catch up. I'm not sure how much the drugs helped, but along with a second walking stick I picked up and a much gentler slope than the first day, I managed to make pretty good time and my knee actually felt a little better at the end of the hike than it did starting out that morning. I passed many people over the course of my trip, a few groups played leap frog with me several times throughout the day, passing each other taking breaks and what not. One of the things that I quite enjoyed about the trip was the camaraderie of the trail. Most of the time I like hiking in more solitary areas, but there is something to be said for the community I've experienced out on some busier trails (it seems to be more pronounced on more strenuous trails then shorter day hikes). When I got back to the parking lot I headed just down the road to the Sol Duc hot springs. It's a commercially developed place, concrete pools and everything. A bit more developed than my preference, but it was a very welcome soak, and I suppose it's just as well that it is developed so there were showers available to wash the trail dirt off before getting into the pools. The other people there were also friendly. Some locals I talked to ended up saving me some time and gas money by recommending I take the Kingston ferry back to Edmonds. It was a long wait headed back to Seattle on a Sunday evening, but I don't think I got back any later than I would have if I drove the whole way, plus I could sit around and read my book. I had known there were ferries to the city, but hadn't given them much thought since most of my experience with ferries in the Puget Sound have been going to the San Juan islands which cost around $50 to take a car on, but the Kingston ferry was significantly cheaper and a pleasant ride. There are more pictures of my trip at this online photo album. I went to the Olympic National Park last weekend. I wasn't sure how it would turn out, but it ended up being awesome! I will post more about it soon, but for now I thought I would just post a little teaser. I also wanted to note that when I got back home around 9:30 Sunday night I saw a rat walking between the roof of my house and the telephone pole on the power lines - from there it was headed to the neighbors tree. There have probably been a lot of times when I could have seen a rat in the city if I had only been looking in the right place or paying attention, but this was the first time I actually did see a rat here. It was actually kind of cute - not that I want to invite it into my apartment or anything.